U.S. President Donald Trump on Thursday canceled his planned trip later this month to the Swiss ski resort of Davos for the annual World Economic Forum (WEF), due to the ongoing partial government shutdown. "Because of the Democrats intransigence on Border Security and the great importance of Safety for our Nation, I am respectfully cancelling my very important trip to Davos, Switzerland for the World Economic Forum," the president tweeted. Trump has locked himself in a stalemate with congressional Democrats in the dispute over his demand for more than 5 billion U.S. dollars for funding a wall along the U.S.-Mexico border. Earlier in the day, Trump told reporters before setting out for a trip to the U.S. southern border that he "won't go" to Davos if the shutdown continues. "Well, I intended to go and speak in front of the world financial community in Davos. That's still on, but if the shutdown continues, which is in a while from now, if the shutdown continues, I won't go," Trump told reporters outside the White House. On Dec. 18, White House Press Secretary Sarah Sanders announced the presidential trip to Davos, adding that the president will be accompanied by an entourage led by Treasury Secretary Steven Mnuchin. According to Sanders, the U.S. delegation comprises Secretary of State Mike Pompeo, Commerce Secretary Wilbur Ross, U.S. Trade Representative Robert Lighthizer, and Secretary of Homeland Security Kirstjen Nielsen, among others. Trump, whose presence at the 2018 WEF was the first by a U.S. head of state since former President Bill Clinton, said Washington has "a great story to tell" at the international gathering this year, which runs on Jan. 22-25. Trump on Thursday headed for McAllen, a city in the southern U.S. state of Texas that borders Mexico, to continue pitching his demand for the wall-funding money. 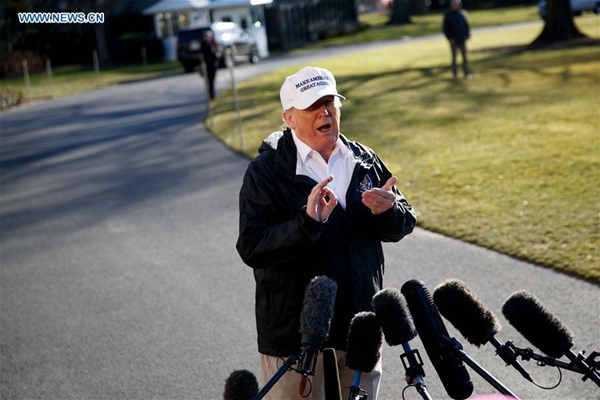 The president said during the press gaggle before his departure that he "would almost say definitely" that he would declare a national emergency at the border, a controversial option he has been publicly contemplating since last week. White House Counsel Pat Cipollone is accompanying Trump during the border visit, as the White House Counsel's Office has been assessing the legal process involved in a national emergency declaration over the wall. While claiming that he has "the absolute right" to make a national emergency declaration, Trump said "it makes sense" to get the wall-funding money from the Congress, but using his executive power to get it done is "the easy route." A U.S. president does have the authority to declare a national emergency, which, in the case of the current deadlock, will enable Trump to bypass congressional approval and build the wall using the Department of Defense money that has already been allocated. However, Democratic lawmakers and legal experts have said Trump's adoption of this method constitutes an abuse of power and will invite immediate court challenges. In a nationally televised speech from the Oval Office on Tuesday night, Trump painted a picture of "growing humanitarian and security crisis at our southern border," justifying his argument with a number of unchecked examples. He at that time refrained from mentioning his decision on national emergency declaration. The partial government shutdown, which now stretched into its 20th day and is set to surpass the 21-day historical record, has paralyzed a quarter of federal agencies and left 800,000 federal employees furloughed or working without pay.